The Series 5000 is our most popular cubicle system. With uncluttered lines and rebated doors this is a functional, practical, economical solution that easily blends with any room or design style. 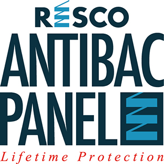 Resco’s most cost effective system, the Series 5000 is a robust solid core Compact Laminate product. The Series 5000’s minimal dirt traps ensure cubicles are easily cleaned, with the option of self-opening and self-closing doors.